Nokia's North American product portfolio dude had mentioned in a recent interview that AT&T's Surge would end up seeing global duty, and sure enough, here it is. Known as the 6760 around the world (which complies with Nokia's typical four-digit naming scheme, by the bye), the phone's specs are basically identical to its Yankee cousin: 3.2 megapixel cam, 2.4-inch QVGA display, AGPS, S60 3.2, microSD expansion, and a side-sliding full QWERTY keyboard. "Typical Nokia" is not a phrase we'd use to describe the 6760, but here's the million-dollar question: can a phone clearly designed with AT&T's needs (and North America's needs) in mind sell elsewhere? Look for it to launch around Europe in this quarter for €199 (about $283) unlocked, with black, red, and white versions becoming available on a region-by-region basis. 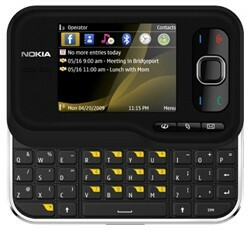 Nokia takes Surge global with 6760 originally appeared on Engadget Mobile on Tue, 21 Jul 2009 17:02:00 EST. Please see our terms for use of feeds.